105 min. Millennium Entertainment. Director: Ariel Vromen. Cast: Michael Shannon, Winona Ryder, Chris Evans, Ray Liotta, David Schwimmer, John Ventimiglia, James Franco, Stephen Dorff. True-crime enthusiasts won't want to miss The Iceman, about a killer whose New York Times obituary was headlined "Richard Kuklinski...a Killer of Many People and Many Ways, Dies." Ariel Vromen's docudrama about Kuklinski proves as matter-of fact as its protagonist, a New Jersey man who happened into a gig as a Mafia hitman while no doubt suppressing the urge to tell his boss, "I shouldn't tell you this, but I would do this for free." The product of a wildly abusive father (a fact briefly established in flashback), Kuklinski would rub out those who rubbed him the wrong way well before veering, in 1965, into mob killing. Michael Shannon (of Take Shelter and HBO's Boardwalk Empire) holds the screen with a typically intense performance. Vromen's sturdy if unexciting direction has the feel not of a Scorsese movie itself, but a fine Scorsesean knock-off—say, Donnie Brasco on a smaller budget. The presence of Ray Liotta as the mob soldier who contracts Kuklinski—and a twin focus on the details of a life in ugly violence and a suburban domestic existence with wife (Winona Ryder) and two kids—bring to mind Goodfellas, were it considerably more dour. There's little verve in Kuklinski's pursuits, marked by his "cold as ice" demeanor (his "Iceman" nicknamed also refers to his preferred method of preserving bodies until they can be most inconspicuously disposed of). The main selling point here—and it's a considerable one—is Shannon, who shows new shadings in the role of Kuklinski, the focus of nearly every scene in the film. There's tightly coiled rage, hard-earned, beneath the man's icy exterior and hard worldview, and Shannon expertly delineates the sensitivity that makes the anger possible and a disturbing, growing confidence that develops over two decades. Still, there's obvious mystery to a man who could—and does—kill upwards of one hundred people with no compunction. Well, one compunction, teased by the film-opening interview query "Mr. Kuklinski, do you have any regrets for the things you've done?" Vromen saves the answer until the final moment, in one of many details that can be directly traced to the source material, Anthony Bruno's book The Iceman: The True Story of a Cold-Blooded Killer. The impressive supporting cast includes Chris Evans (disappearing into Richard's professional colleague Robert "Mr. Softee" Pronge), James Franco, Stephen Dorff, David Schwimmer, John Ventimiglia, and Robert Davi, but it's all about Shannon—one of the most interesting actors working—and Kuklinski's jaw-dropping story. The film's big problem is Vromen's unfortunate ability to turn that story into something plodding, but Shannon compensates with his potent characterization. In Milennium's special-edition Blu-ray, The Iceman retains its theatrical look, which seems to be intentionally hazy in an evocation of period. Contrast, therefore, isn't very vigorous, the image isn't ultra sharp, hues are muted but can be distinctive all the same, and shadows loom. Other than a bit of noise in low light, though, the image is satisfactorily resolved, clean and true to source, and certainly a big step up from DVD. Sound comes in two audio options: lossless Dolby TrueHD 5.1 and lossy Dolby Digital 2.0. Obviously, the former is the preferable choice, with clear dialogue, full-bodied music, and a nice bump from LFE, despite little activity in rear channels. 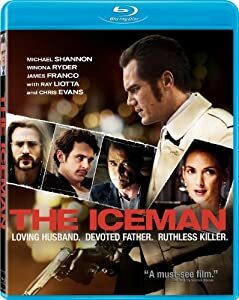 "The Making of The Iceman" (28:34) consists of interviews including director Ariel Vroman, Michael Shannon, Winona Ryder, and Chris Evans. It's an impressive roundup of EPK-style comments on the film. "Behind the Scenes" (8:04) offers raw B-roll footage from the set, which, though shorter, perhaps offers more insight into the making of the film. All site content © 2000-2019 Peter Canavese. Page generated at 04/25/2019 02:57:46PM.